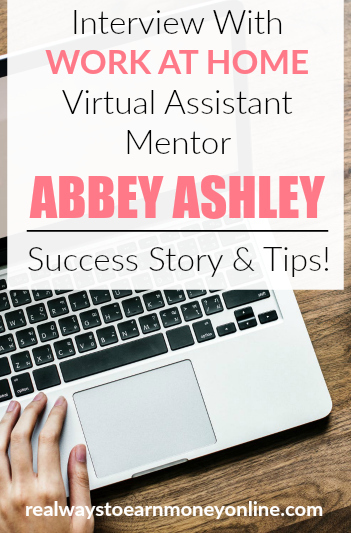 Interview With Abbey Ashley – Successful Virtual Assistant Mentor & Biz Owner! Published September 5, 2018 By Anna T. This post may contain affiliate links. Regardless, I only recommend sites I've researched and/or used and trust. Today's post is an interview between me and Abbey Ashley, founder of The Virtual Savvy. I hope you'll enjoy and benefit from the interesting information Abbey has shared with us about her career as a virtual assistant, how she got her business thriving, and some tips on how you can work from home on your own terms as a virtual assistant as well! You may also want to check out the free training and programs Abbey offers to help other aspiring VA's get their own businesses off the ground. You can see our interview below! Would you consider a career in virtual assistance to be entry-level, or does it work out better for people with lots of clerical experience and/or college degrees? Virtual Assistance is an AWESOME entry into working online. In fact, in my opinion it is the FASTEST and EASIEST way to start an online business. I've had students replace their full time income with just 2-3 clients. No official training or college degree is necessary. While Virtual Assistance is great for most – there are a few qualifications that I believe are important. First, having good communication skills (especially written communication) is a must. Most of the communication you will have with clients will be via email – so being able to communicate well with the written word is essential. What kinds of businesses typically need the services of a virtual assistant? As we approach a more digitized world, more and more small businesses are seeing the value in having a virtual assistant to support them. The majority of businesses that are bringing on virtual assistants are online businesses, but I am starting to see many brick and mortar businesses hiring virtual support as well. In addition, many service providers like real estate agents, attorneys, and insurance agents are beginning to hire virtual help for their businesses. What are some common services virtual assistants offer to clients? My definition of a virtual assistant is someone who can assist a business owner with administrative and/or marketing skills, all done remotely. That definition can cover a wide variety of services (in fact, I list 50+ services a virtual assistant can offer here). I suggest starting with the tasks that you already know how to do, and then slowly add more services to your arsenal as you go along. You don't need to be an expert in EVERYTHING to start helping businesses owners! Be honest about what you do and don't have experience in, and always communicate that you are willing to learn new skills. Some of the most common tasks I see virtual assistants handling for small business owners are: answering customer service emails, writing and scheduling blog posts, scheduling social media posts, managing a community, inbox organization, research, travel planning, and invoicing and payment processing. What is the earning potential for someone who is running a virtual assistant business (approximate hourly rate)? I normally suggest that U.S. based virtual assistants start their rate at $25-$30 per hour. This may seem high for some, but we must remember that as an independent contractor, you will be responsible for paying self-employment taxes – as well as your own health benefits, office supplies, etc. This is all taken into consideration for choosing your hourly rate. Once VAs have been working for clients for some time, they may want to transition to “value based pricing”. For instance, you may manage someone's Pinterest account and it may eventually take you only 15 minutes a day to manage it. However, what is the VALUE of that service? GREAT! I've known virtual assistants to charge $600+ per month for this service, because they choose to price based off of their value and not their hourly rate. Many VAs will go on to form an agency – hiring subcontractors so they can take on more clients. Those VAs who have high end packages and / or subcontract can make $10,000+ in their business! Is it expensive to get a virtual assistant business going? There are SO many wonderful reasons to start a VA business but one of my FAVES is the low entry requirements. Do you have a reliable computer and fast internet? Then you've got what it takes to get started! Eventually, you will want to invest in things like: forming an LLC, a website, business cards, invoicing software, etc. However, you do not NEED any of these to get your first client and start getting paid! I usually tell my students to get one client, then let that income pay for the next expense you need to help grow your business. How difficult is it to find clients? Finding clients can be easier than you think. Stop and think – do you know ONE small business owner? Someone is probably coming to mind. Just like you know ONE small business owner – most of your friends and family probably know one small business owner. Just simply start telling the people in your circle what you are doing and you may very well find your first client this way! MANY of my students find their first client simply by telling the people they already know what they are up to! Please share a little of your story with us — how did you get started as a virtual assistant? I got married just eight short years ago to the man of my dreams. He’s seriously the best y’all. I’m from Missouri and he’s just country enough to understand my twang and the most extroverted person on the planet. Within three months of marriage, we got pregnant (surprise!). Before our third anniversary, we had moved three times, had two kids, started pastoring the youth group at our church, and each started our own businesses. I’ve wanted to be an entrepreneur since I was in high school and saw my dad launch his own business. With a few marketing and management degrees under my belt, and a LOT of self-study, I decided to launch my own Virtual Assistant business … WHILE I was on maternity leave. I don't suggest this – haha, but it's what I did! The craziest thing happened … WITHIN ONE MONTH I WAS SOLD OUT OF MY SERVICES!! Within 4 months I had brought on four subcontractors to help me with the overload of work. I was able to quit the job I had been working to bring extra money in for our family, and was consistently bringing in serious income for our family without having to spend all day without my kids. Over the years, I started giving tips to others who saw the freedom and flexibility I had in my business. I began to lead them step-by-step through the process of launching and growing their own Virtual Assistant business. I now offer trainings and programs to help other virtual assistants launch and grow their own business from scratch! Abbey – Thanks so much for your time! If you are interested in starting your own virtual assistance business, be sure to check out some of Abbey's resources. She offers free training designed for aspiring virtual assistants. This training goes into detail on the path to $100K, what paying clients want in a virtual assistant, and some tips on getting out there and finding those clients who need what you can offer!